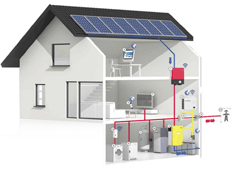 Off-The-Grid applications may use solar PV as their primary power source. This can normally deliver suitable power during daylight hours but overnight or when the light radiance starts to drop the output from a solar PV array will be non-existence or negligible. The way to tackle this issue is to use some form of battery pack to store excess electrical power not used during the day and then to draw on this during night time hours. However care has to be taken selecting the right battery and its sizing. When sizing a battery system for a solar PV application it is important to consider several aspects. The actual load to be powered must be sized in Watts (or kW). The runtime period required during night operation should be calculated to determine how long the battery pack should run for on discharge. The amount of power available to charge the battery pack must be known. The physical environment has to be assessed in terms of ambient temperature range as a high ambient could lead to an early failure of the battery set. The entire project must be reviewed as well in terms of the overall economic viability of using stored energy as opposed to grid supplied electricity. Once these factors are established a suitable battery can be chosen. Here the choice continues to widen. There are several types of suitable lead acid batteries for standby power applications including Valve Regulated Lead Acid (VRLA) and Flooded Lead Acid (FLA). The problem with FLA batteries is one of maintenance in that they lose electrolyte during charging as liquid is converted to gas. They require regular inspection and monitoring and it may be necessary to periodically top-up their electrolyte with distilled water to prevent plate damage. FLA batteries are most commonly used for very large standby applications above several hundred kW in power. VRLA batteries are sealed and maintenance free and the most common battery type for standby power applications including UPS systems. Most lead acid batteries have a design life of 5 or 10 years, though 15 to 20 can be an option for FLA-types. In standby power applications, this design life can be halved by high ambient temperatures. Lead acid batteries typically require a 20-25°C ambient environment to perform to specification. A high ambient can dramatically shorten the life of a lead acid battery by as must as half for every one degree rise above 30°C. Lithium-ion batteries are another type of battery technology being developed for standby power and energy storage applications. Aside from them being more suited to the high number of charge/discharge cycles than lead acid batteries, Lithium-ion batteries are also more temperature tolerant and can have a longer working life. The downside is their cost compared to traditional sealed lead acid batteries. The life of any battery is generally determined by the depth of discharge, number of charge/discharge cycles, charge specification and overall ambient temperature. In what may be termed ‘traditional’ standby power applications such as an uninterruptible power supply, the batteries are installed within controlled ambient environments; typically a datacentre or comms room. They are not subjected to the high charge/discharge cycles of an off-the-grid energy storage system. Therefore, when considering lead acid batteries for renewable standby power applications it is accepted practice to oversize the battery set to ensure that it only ever reaches a maximum of 50% of its overall discharge capacity. Effectively this doubles the battery capacity and installation size but protects the battery and its electro-chemical construction. In contrast Lithium-ion battery sets can be right-sized closer to the actual design load thanks to their ability to cope with a high number of charge/discharge cycles. However, they are more costly on a like-for-like size basis (measured in Ampere-hours – Ah). Lead acid batteries therefore remain the product of choice for energy storage applications due to their low manufacturing costs. Lithium-ion technologies may become a more accepted technology as their costs reduce and confidence grows in their ability to support such applications.